September 1066 saw the first of two invasions of that fateful year when a Norwegian force under Harald Hardrada sailed along the River Ouse intending to attack York. 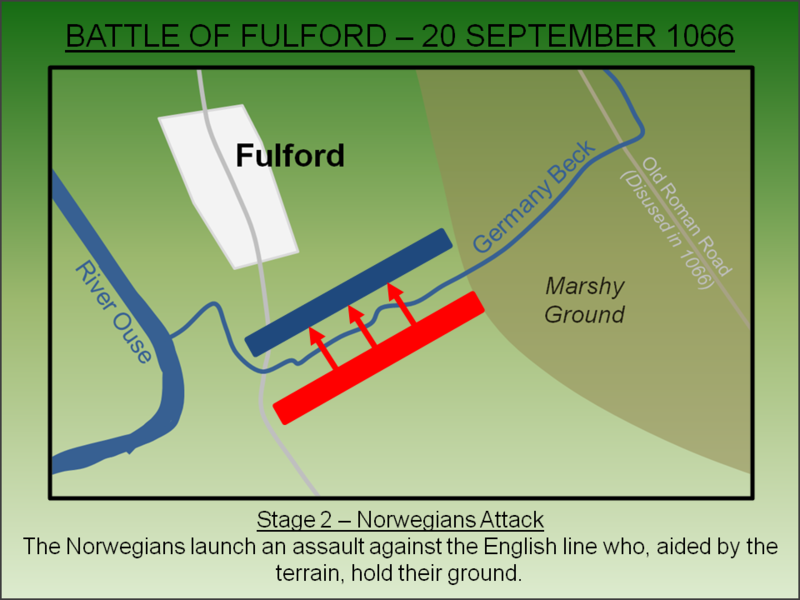 With the English King in the south awaiting the Normans, the northern Earls raised an army and engaged them at the Battle of Fulford but the Norwegians were victorious. On the 5 January 1066, the English King Edward the Confessor died childless. During his reign he had carefully managed a number of competing claimants to his throne but his death incited them into action. Allegedly Edward had, on his deathbed, nominated the most powerful English landowner Harold Godwinson, Earl of Wessex as his heir and successor. This famously enraged William, Duke of Normandy - who had possibly been promised the English throne by King Edward in the 1040s - and who subsequently started invasion preparations that would culminate in the Battle of Hastings in October. However there was another claimant seeking to exploit the situation; Harald Hardrada, King of Norway. Although he had a very weak claim to the English throne – allegedly an agreement had been made between King Magnus of Norway and King Harthacnut of England circa-1040 where each agreed to succeed the other if they died without natural heirs - it is equally possible that this great Viking warrior wasn’t too concerned about legal niceties and simply saw an opportunity for conquest. Allied to Hardrada was Tostig Godwinson, Harold’s own brother, who until Autumn 1065 had been Earl of Northumbria. He had been ousted by a local rebellion and another northern magnate, Morcar, had been invited to take his place. Despite King Edward supporting Tostig, he was ultimately forced to accept Morcar. The situation didn’t change when Harold became King and Tostig sought to make his claim by force. In May 1066 he sailed from Flanders with 60 ships attacking the Isle of Wight and Sandwich before moving north to Lincolnshire where his small force was defeated by Edwin, Earl of Mercia. With only 12 ships remaining he retreated to Scotland where he was placed under the protection of King Malcolm. Tostig now allied himself with Hardrada and the two made plans to combine forces for an invasion in the north. The Norwegian King rendezvoused with Tostig's forces in the Tyne with a force of at least 300 ships. Sailing down the Yorkshire coast, raiding coastal sites as they went, they proceeded into the Humber and up the River Ouse intending to attack York. They landed at Ricall, about 10 miles south of the city, and advanced towards their target. The English King, Harold II, was in the south awaiting a Norman invasion and it fell to the northern magnates to muster an army. The two leaders were Edwin, Earl of Mercia and Morcar, Earl of Northumbria who collectively amassed a large force. 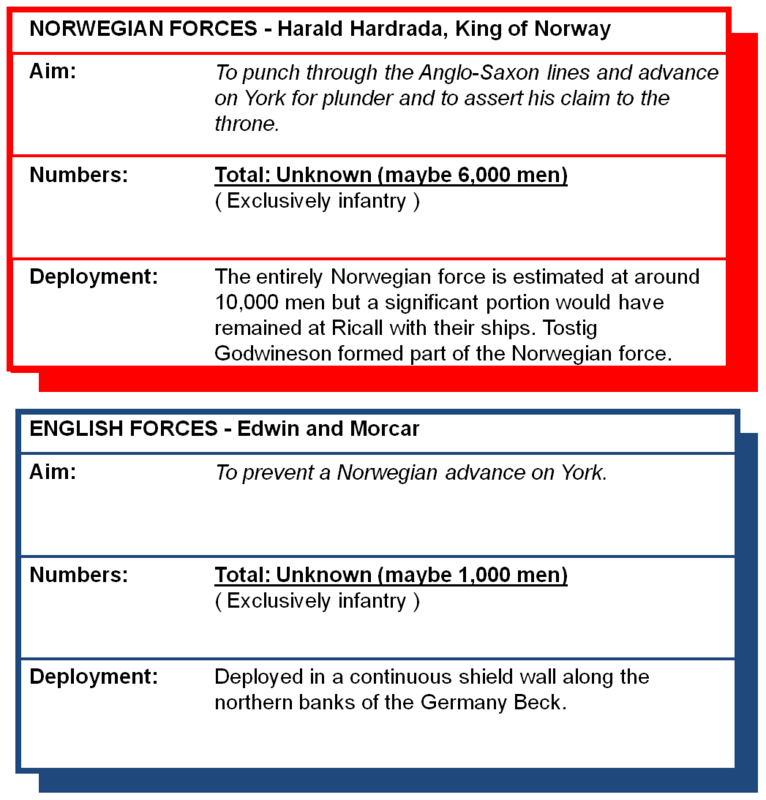 Assuming their King was unable to bring his army north in time to save York and the surrounding area, they moved to intercept the Norwegians by blocking their advance towards the city. 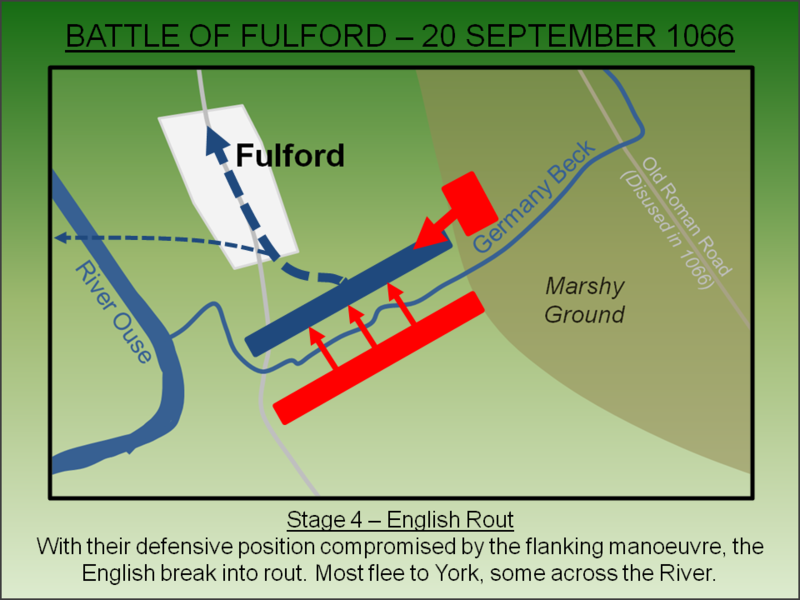 They deployed at Fulford – a settlement around 1 mile south of York at a point where the medieval road forded the Germany Beck. Numbers of troops available to both sides are largely unknown although we can cautiously comment on factors that indicate the size of each force. For the Norwegians we have a starting figure of circa-300 ships implying a force circa-8,000 to 10,000 strong from which a significant detachment of troops would have been left with their ships at Ricall. For the English we have no figures, other than a single account (probably greatly exaggerated as with most medieval casualty figures) that refers to 1,000 English slain as the battle ended. We can however calculate the English frontline at around 400 metres in length suggesting they must have had at least 1,000 men. Given the battle was almost immediately eclipsed by the events of the Battles of Stamford Bridge and Hastings, few authors past or present gave much thought to the events at Fulford. In particular contemporary records from the battle are extremely limited and, at best, we can only re-construct an outline of the action. The English formed up along the north bank of the water now known as Germany Beck. This provided a strong defensive feature in front of their line making a direct attack against their shield wall a difficult prospect. Furthermore their left flank was protected by marshy ground and the right by the River Ouse. Overall the English front line had a frontage of around 400 metres. The Norwegians launched an attack against the English line who, aided by their strong defensive position, held against the onslaught. Unable to break the English line, the Norwegians flank round to the east. Possibly using the old Roman road to advance through the marshy ground, they crossed Germany Beck and attacked from the rear. With their strong defensive position compromised by the Norwegian flanking attack, the English break into rout. The contemporary author Marianus Scotus, in his Chronicon, noted that a hundred priests who had accompanied the Anglo-Saxon army were killed along with 1,000 soldiers. However, with just 1 mile to York, it is probable many made it to the safety of the city's walls. Despite their victory, the Norwegians did not advance onto York. Perhaps this was indicative of the Norwegians having suffered extensive casualties and not wishing to erode their force by a direct assault on a well protected target. Alternatively perhaps York's immediate capitulation, where they offered hostages and supplies to be delivered to Stamford Bridge some 8 miles east of the city, met their immediate aims. Either way the Norwegians now changed direction and moved towards Stamford Bridge where they established their camp. A mere 5 days later, King Harold II entered York with his army and proceeded directly on towards Stamford Bridge where he surprised and defeated the Norwegian force. Lancaster, J.H.D (2015). Fulford: Battlefield visit notes and observations. CastlesFortsBattles.co.uk. Ordnance Survey (2015). York. 1:2500. Southampton. 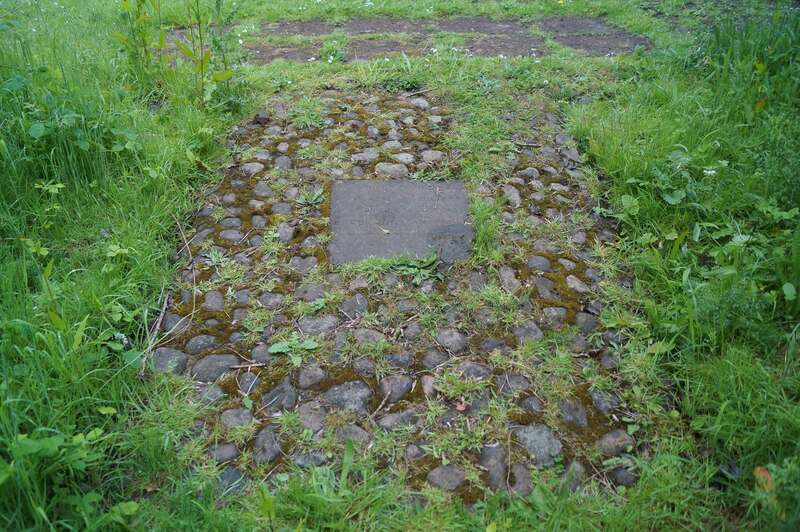 There is a small plaque marking the battle and Germany Beck still runs through the site. However much of the area has been developed and there is now very little to see. Battlefield Plaque. The battle is commemorated in a small plaque found in a corner of the playing field. Finding the Plaque! 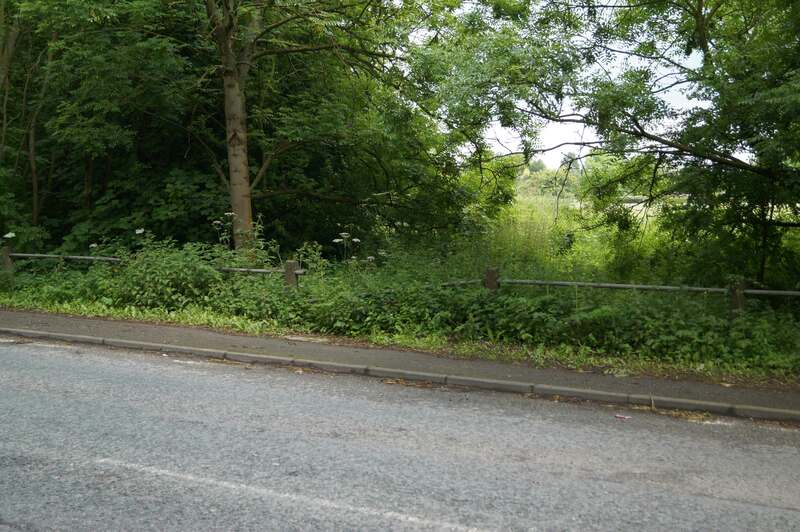 The location of the plaque is not immediately obvious for it is somewhat overgrown. It can be seen from the A19. Germany Beck. 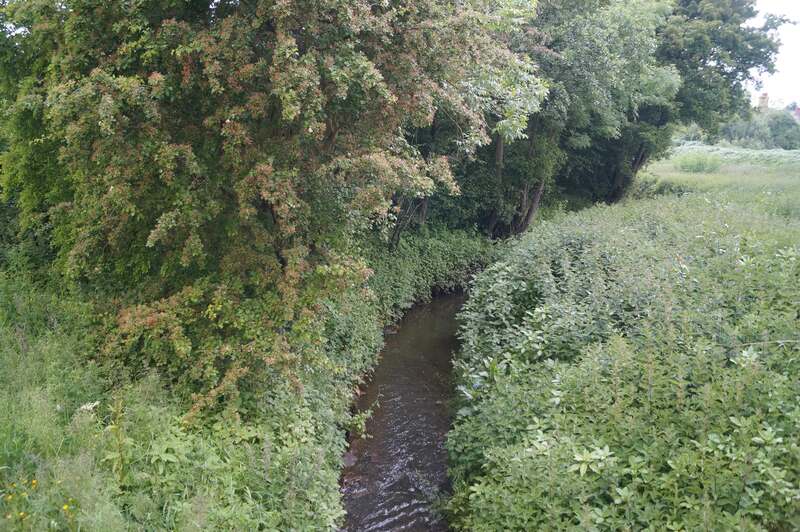 Although significantly narrower than in the eleventh century, Germany Beck can still be seen. The English used this as a defensive obstacle when facing the Norwegians.